Career Resources Corporation has been awarded a $1,500 grant from the Merrimack Valley General Fund, a fund of the Essex County Community Foundation (ECCF). Career Resources will use the grant funds to support additional Veterans in their Veterans Employment Program. The Merrimack Valley General Fund (MVGF) is a field of interest fund at ECCF serving agencies in the Eastern Merrimack Valley. The fund was established when the Merrimack Valley Community Foundation merged with ECCF in 2004. The MVGF funds programs serving the community in the areas of Arts and Culture, Education, Social and Community Services, and Youth Service. “Since the beginning of the Veterans Employment Program we’ve had tremendous success serving over 60 Veterans. 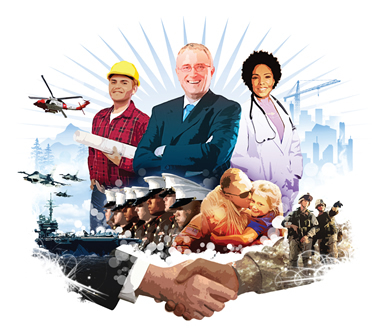 We are excited to be able to provide additional services to more Veterans of Career Resources. Creating new employment opportunities for our clients if core to our mission.” Said CEO, Brad Howell. We welcome anyone interested in hiring a Veteran to contact us today! For more details please visit our website, www.crc-mass.org or call 978-374-9122 to learn how you can be a part of Career Resources mission to erase limitations. If you would like more information about this topic, please contact Nicole Sammartino at 978-374-9122 x228 or email at Nsammartino@crc-mass.org.